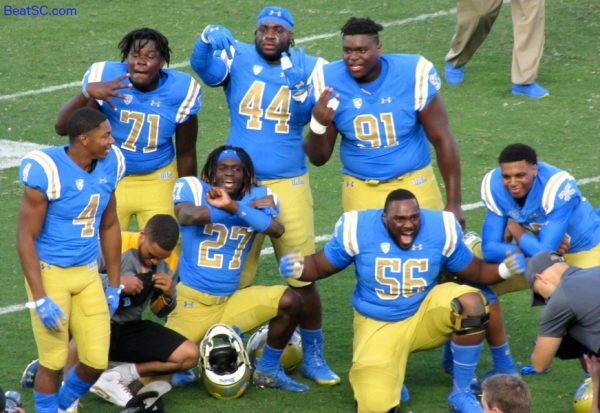 Bruin Running Back Joshua Kelley just did something no other Bruin has ever done before — The jovial transfer from UC Davis(!) rushed for 289 yards against UCLA’s crosstown rival u$c. Maurice Jones-Drew, Skip Hicks, Gaston Green, DeShaun Foster — None of them ever gained close to that many yards against the trojans. In fact, the 289 yard mark is a record for any player of EITHER team in the Rivalry Game. Not Reggie Bush, Marcus Allen, Charles White, Anthony Davis, Ricky Bell, or even O.J. Simpson ever hit 289. Of course O.J. still holds the record for most murders, but that’s another story. Kelley’s career night also saw him break 1000 yards for the season, and tally at least 1 TD in 7 straight games. I don’t know how a guy with Kelley’s immense ability ever landed at UC Davis. As he has shown all season, his INSTINCT for finding holes, WAITING for gaps to open, and knowing exactly which way to cut, is uncanny. Kelley was the MVP of this game far and away, but he did not win the game single-handedly. It was a real team effort, and it took the whole team to pull this off. It was a seesaw battle throughout, with FIVE lead-changes, and the game was not over until there were only 30 seconds left. SC took the opening kickoff, and drove right down the field, mostly through the air. The drive stalled and troy settled for 3. 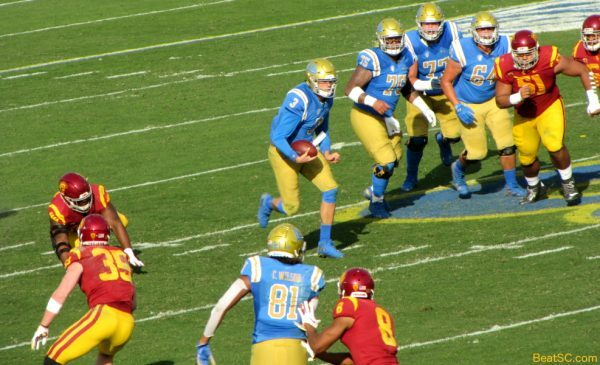 The Bruins answered on their first drive, which culminated in a 33-yard TD strike from Wilton Speight to a diving Theo Howard, whose knee hit just inside the back end line of the trojan end zone. 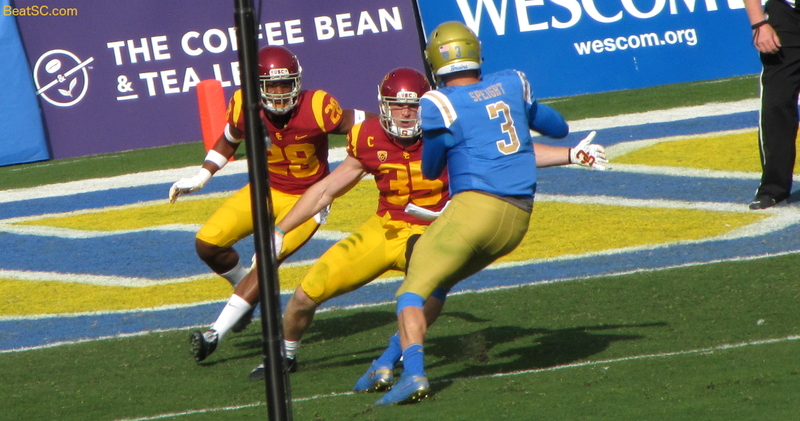 After sc missed a Field Goal, the Bruins scored again, spurred on by a 61-yard run by Kelley, which set up a 4-yard scramble by Speight for a TD. The 14-3 lead didn’t last long. SC’s J.T. Daniels completed a 44-yard TD pass to Amon St. Brown, and then SC blocked a Bruin punt, and returned it 5 yards for the go-ahead score. 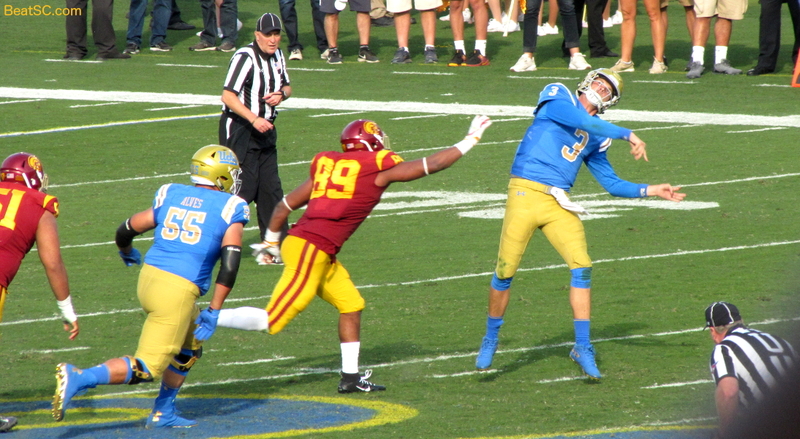 After a Bruin punt that wasn’t blocked, Daniels overthrew a Receiver into the arms of Nate Meadors, who looked like he was the one running the route, ahead of the intended Receiver. 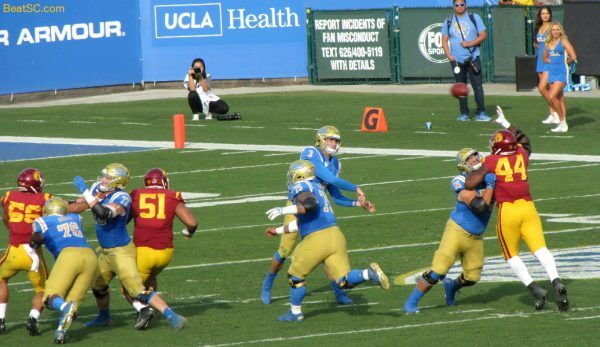 The ensuing Bruin drive might have stalled, but the trojan thug mentality reared its ugly head, when sc Defensive Tackle Brandon Pili punched a Bruin in the head. He was flagged for Unsportsmanlike Conduct, and for some inexplicable reason, was NOT ejected from the game like he should have been. The TV announcers were stunned that he was allowed to remain in the game. The only thing I can think of is that Pili was retaliating to getting pummeled by a Bruin blocker who went a little beyond the call of duty, so the refs cut Pili some slack. Regardless, the major penalty gave the Bruins a first and goal, and Kelley ended up scoring from the 1, to make it 21-17. 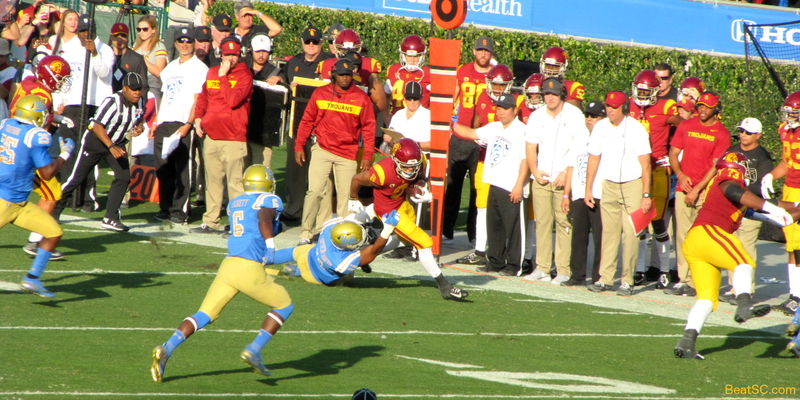 That lead was short-lived, as sc scored on a great play — a short pass to Velus Jones, who was about to be tackled by Quentin Lake when Lake was taken out of the play by a nifty block, freeing up the speedy Jones to scoot into the end zone for a 45-yard score. Then the teams traded punts before the half, so the score at intermission remained 24-21 troy. The over-under for the game was 55, and 45 was scored in the first half. SC was moving the ball at will through the air, as Receivers were getting open downfield, and Daniels, who had WAY too much time in the pocket, usually found them. He had over 200 yards passing in the first half alone. 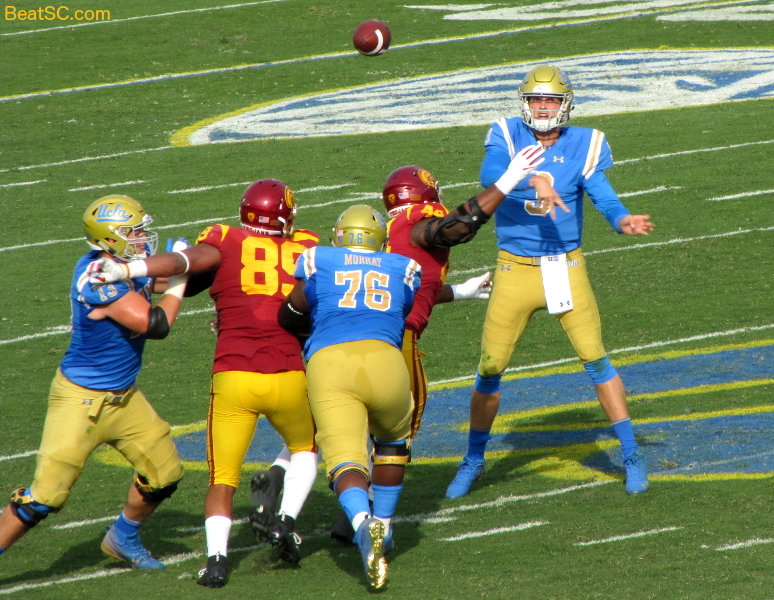 It didn’t look like UCLA could win this game, because sc could convert any third down with a long pass. 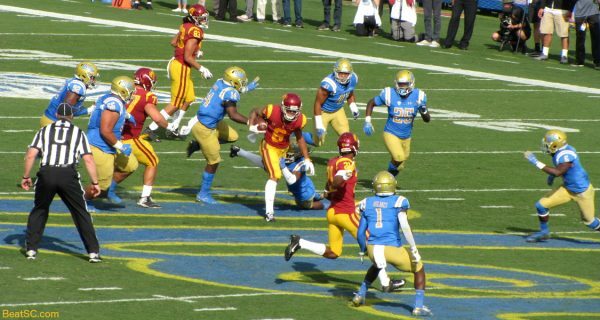 They had over 6 plays over 20 yards, as a Bruin team that has usually limited long completions (in favor of allowing long runs) was NOT covering Receivers as well as they had previously. 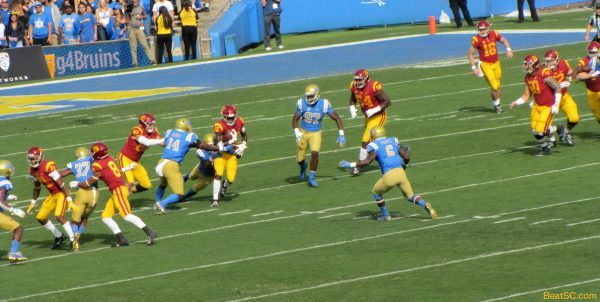 The UCLA Coaching Staff must have made some adjustments at the break, because the trojans were held without a TD in the second half, just like they were against Cal last week. Two games in a row for sc without a Touchdown after Halftime! The first drive of the second half ended when Speight threw an ill-advised bomb into the end zone, into double-coverage, and it was picked off. 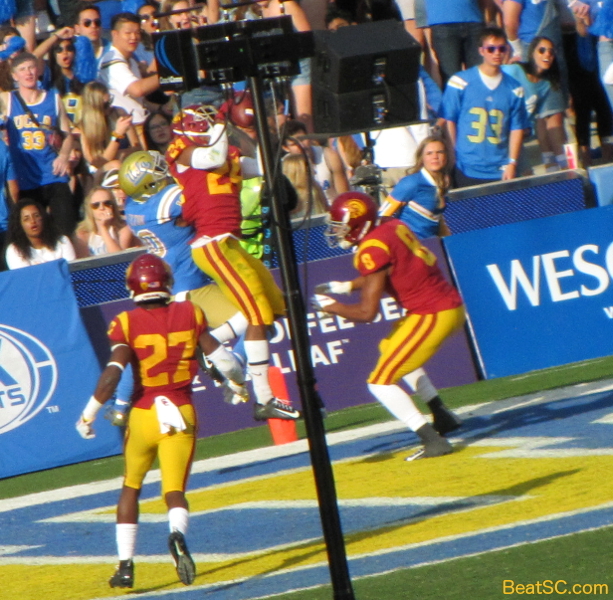 SC’s subsequent drive resulted in another Field Goal, which made it 27-21. 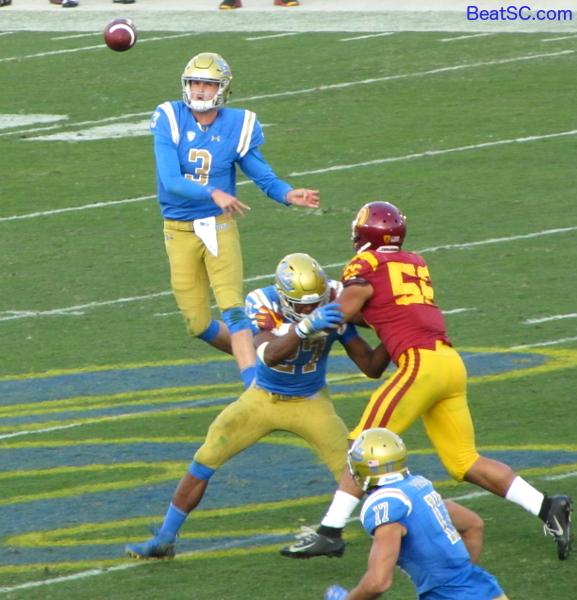 The teams then traded punts, and then the Bruins’ first possession in the 4th quarter, which started at their own 3-yard line, covered 97 yards, and hit paydirt with Kelley’s 55-yard TD run that put UCLA up 28-27. Daniels immediately followed that up with a horrible pass to no one — perhaps a Receiver screwed up the route — and not one but two Bruins were in position to Intercept the ball. 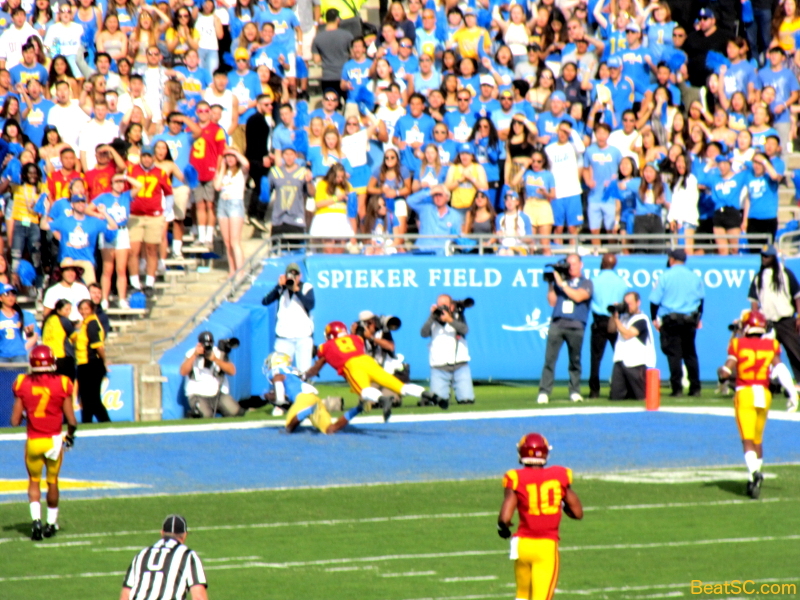 Darnay Holmes came down with it, and that led to a short Field Goal for J.J. Molson to make it 31-27 with just over 6 minutes left. Earlier, UCLA’s Special Teams had a Punt blocked for a TD, and they gave up a Fake Punt play for a 1st Down. 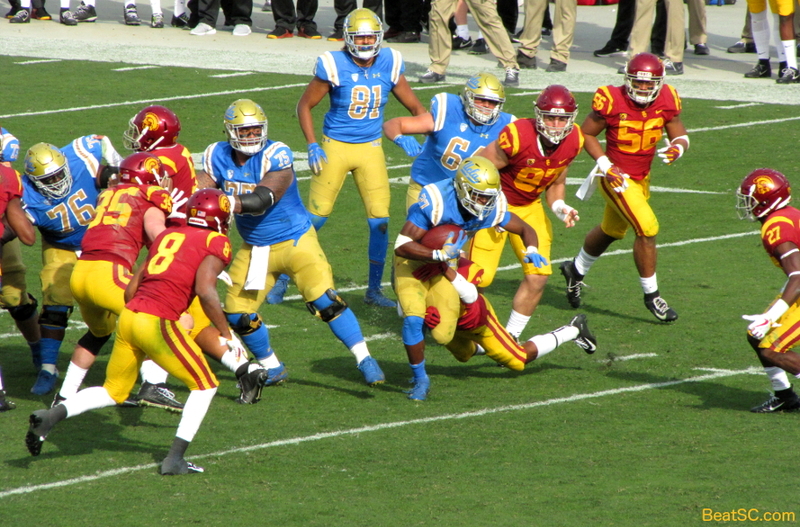 But with 6 minutes left, they tackled the Kick Returner at the trojan 13 yard line. 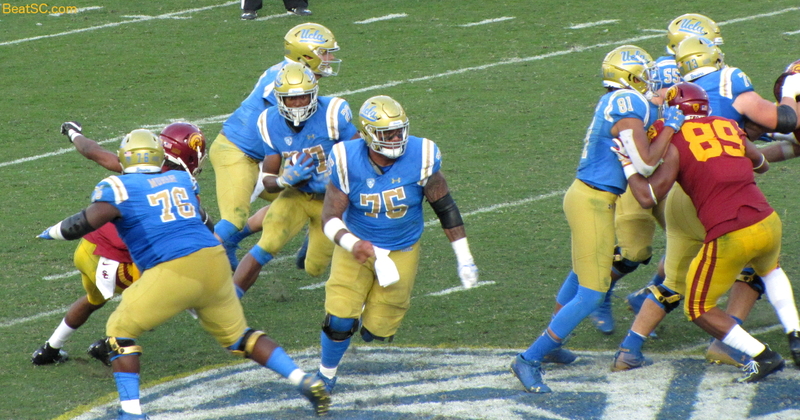 The Bruin D forced a 3-and-out, and then the Special Teams came through again, as Molson hit a 48-yard Field Goal to put UCLA up by 7 with 2:08 to go. 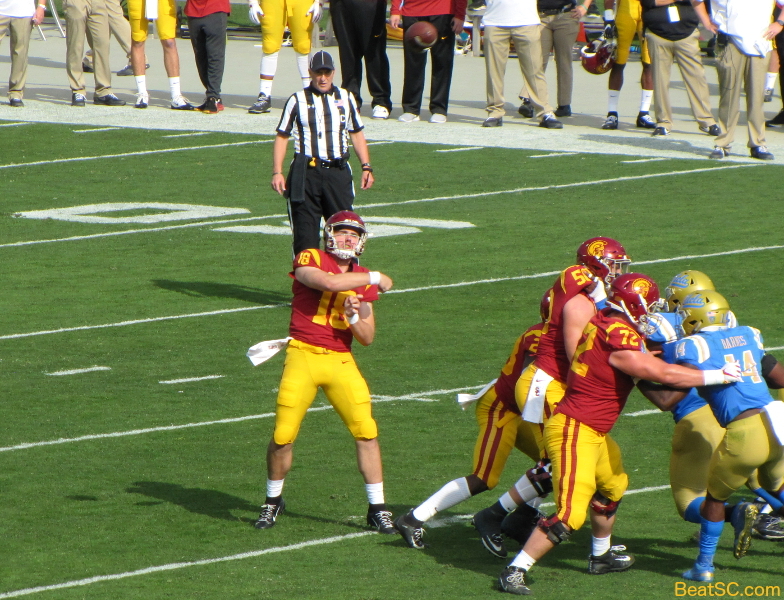 SC still had plenty of time left to tie it up, and they drove down the field into striking range. But with 13 seconds left, on 4th Down, Daniels threw a short pass that Linebacker Krys Barnes broke up, and that was the game. Barnes was the Defensive Hero — Besides the game-clinching play, he also had one other pass break-up, plus he led the entire team with 11 tackles, including 1 Tackle-for-loss. Adarius Pickett was second, with 8 Tackles. On the Offensive side, in a supporting role to Kelley, was Speight, who went 13-22 for 166 yards, with 1 Passing TD, 1 Rushing TD, and 1 INT. He missed a couple targets and threw the bad INT, but he also hit a few miracles while avoiding ferocious pressure. VERY POISED PERFORMANCE overall. It looks like the decision to go with the 5th-year Senior over the True Freshman may have been a good call by Kelly. 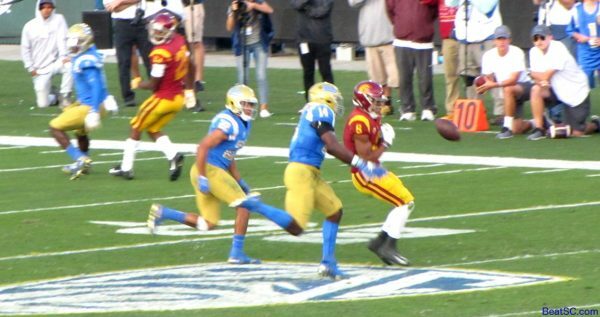 On the Receiving end: Theo Howard caught the 33 yard TD and totaled 76 yards Receiving, and Tight End (and former trojan walk-on) Caleb Wilson caught 4 passes for 63 yards, including one incredible leaping grab after Speight Houdini’d out of what looked like a sure Sack and heaved the ball downfield at Wilson. Like I said — a TEAM EFFORT. This gigantic Bruin victory over the Evil Ones means more than just a W in the standings. First of all, it establishes Chip Kelly as a Coach who is leading a team to marked improvement. 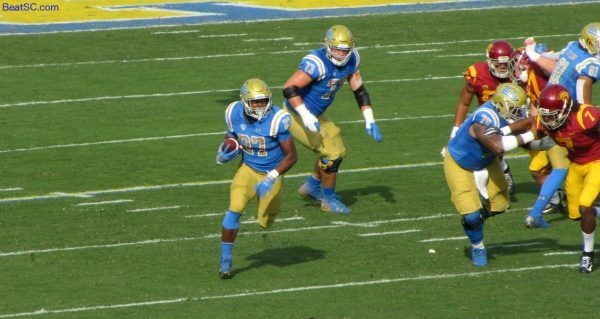 Secondly, it will affect recruiting in a positive way for UCLA. There were about 100 potential recruits on the sidelines on Saturday. 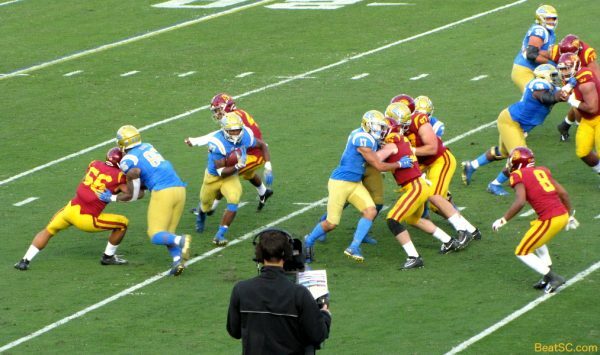 Thirdly, the loss kept the trojans from becoming BOWL ELIGIBLE. Now they have to beat undefeated #3 Notre Dame to qualify for postseason play — a tall order to be sure. 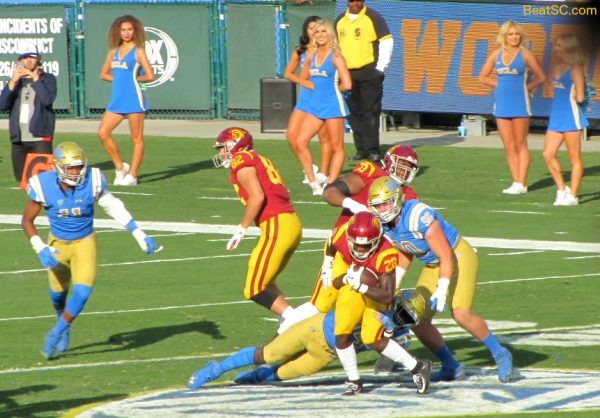 Finally, the loss pretty much assures that trojan Head Coach Clay Helton will be unemployed in a couple of weeks. That’s too bad for UCLA, because this 5-6 Helton team looks thoroughly undisciplined and POORLY-COACHED. It would be nice if AD Lynn Swann continues to make bad decisions, and elects to retain Helton for another season or two. Below are 38 FOOTBALL photos from the game, in chronological order. I will post dozens of CHEERLEADER PHOTOS in a separate article. 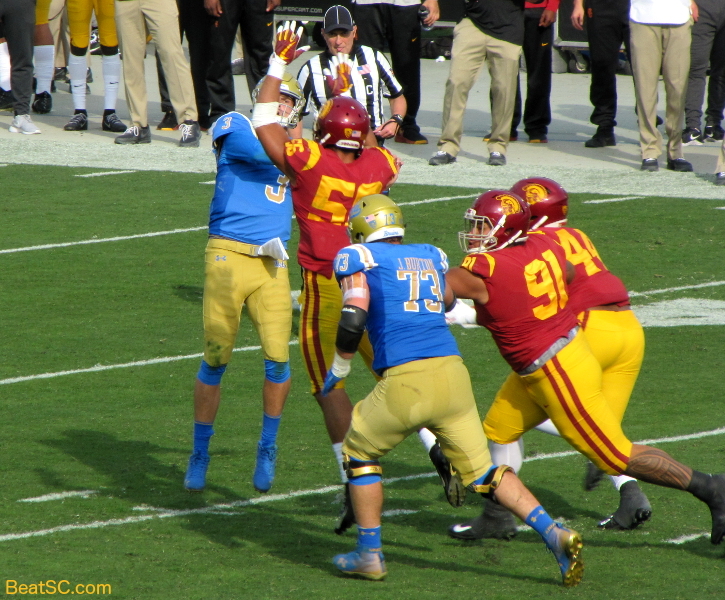 Opening drive: The Bruin D looked a little tentative early. J.T. Daniels had great blocking and plenty of time to find the open man. 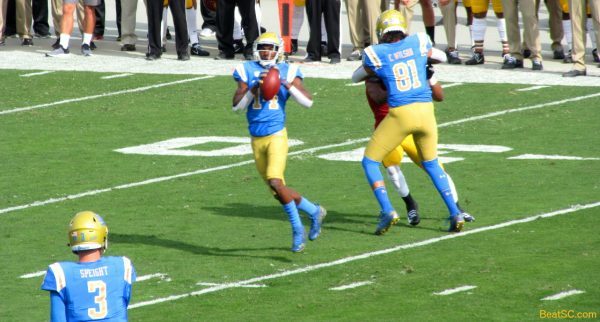 Wilton Speight’s first completion was a slant to sure-handed Theo Howard. Somehow, Speight miraculously evaded this tackle and completed a long pass to Caleb Wilson. The AMAZING Joshua Kelley, just getting started. Howard makes the diving TD grab, with his knee coming down JUST inbounds. Daniels awkwardly throws a wild incompletion. Darnay Holmes breaks up a potential TD pass. Kelley almost always found running room. 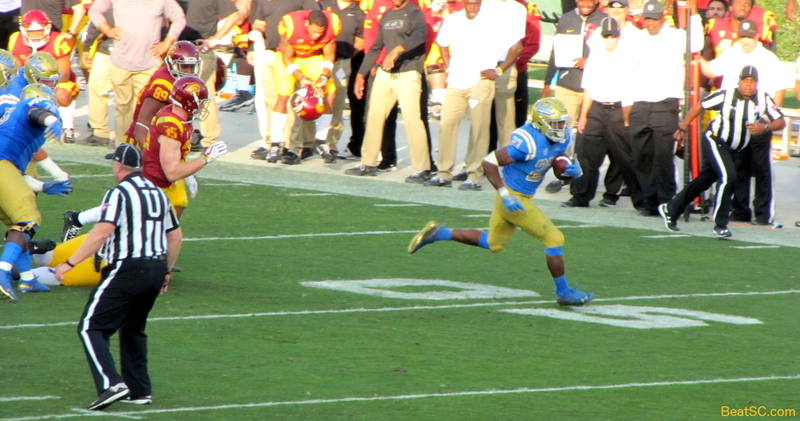 This is Kelley’s 61-yard run — His longest ever. Speight’s CALLED Keeper didn’t fool anyone. Then he dropped back to pass, couldn’t find anyone open, saw an opening, and ran into the end zone for 6. Seems like this was the first game where the opponent didn’t break huge runs. But Kelley broke huge runs over and over. The UCLA Offensive Linemen improved so much this year. 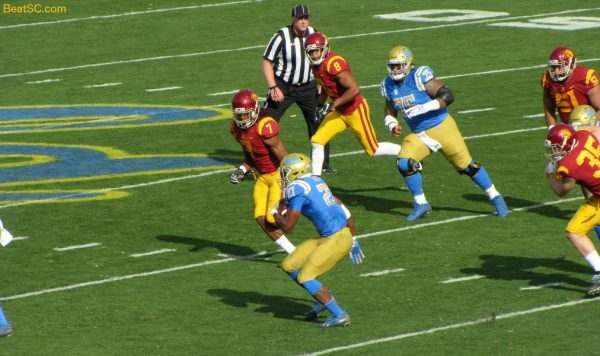 Speight has great field presence, and got rid of the ball when he had to, often connecting. Kelley is like J.J. Stokes now — a Rivalry Legend. Speight actually completely this “prayer,” to Howard near the goal line. 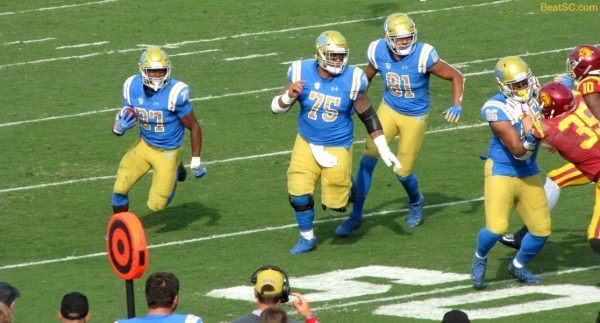 It’s been several years since the Bruin O-Line has looked this good pulling and leading the Backs. This is Velus Jones’ TD. 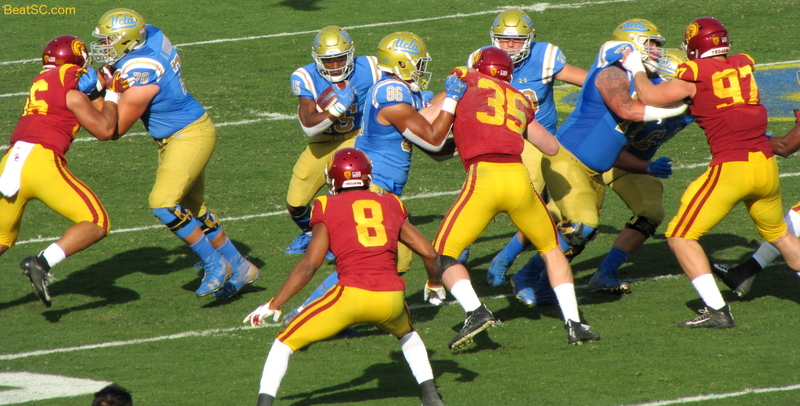 Quentin Lake was in good position, but a great block knocked him out of the play. Speight used his legs a few times to get the Bruins out of trouble. Here, Martell Irby spells Kelley. Speight throws over the middle. 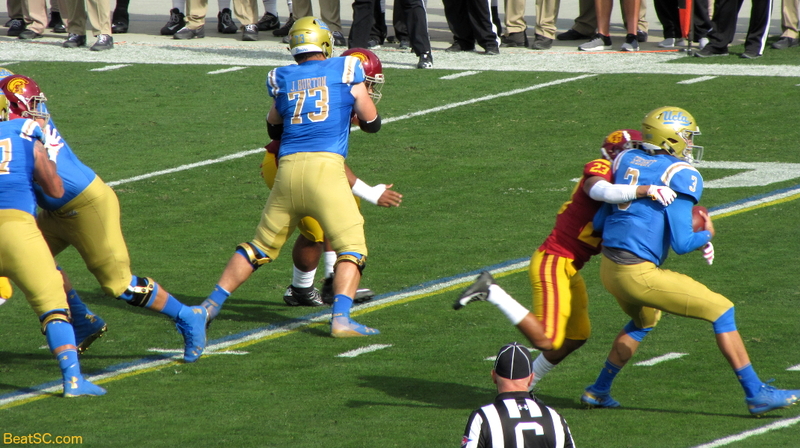 Speight again avoids a Sack. Kelley gets ready to straight-arm a trojan. 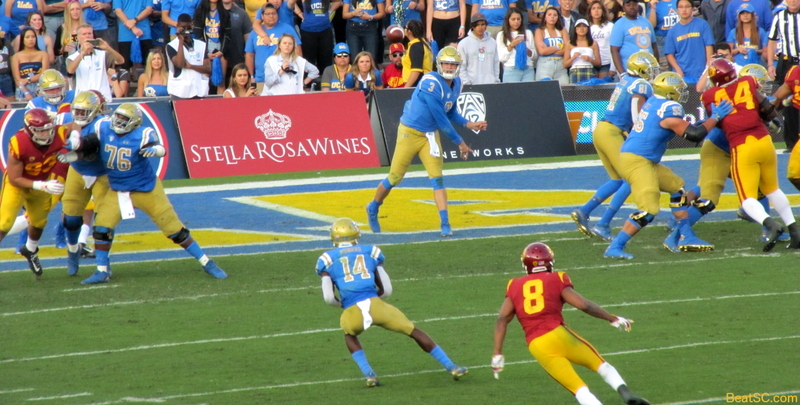 This is Speight’s ill-advised throw that was picked off in the end zone. Keisean Lucier-South attempts a tackle along the sidelines, but the ballcarrier escapes his grasp. Speight targets Howard again for a big 1st Down. 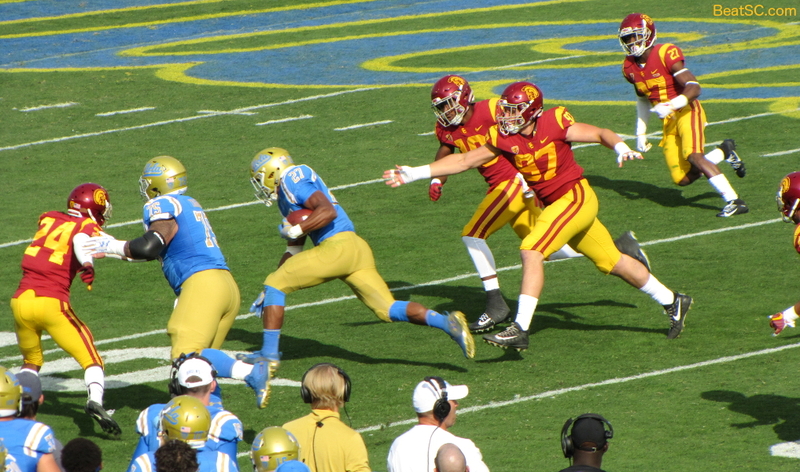 …and races into the end zone for his 55-yard game-winning Touchdown. 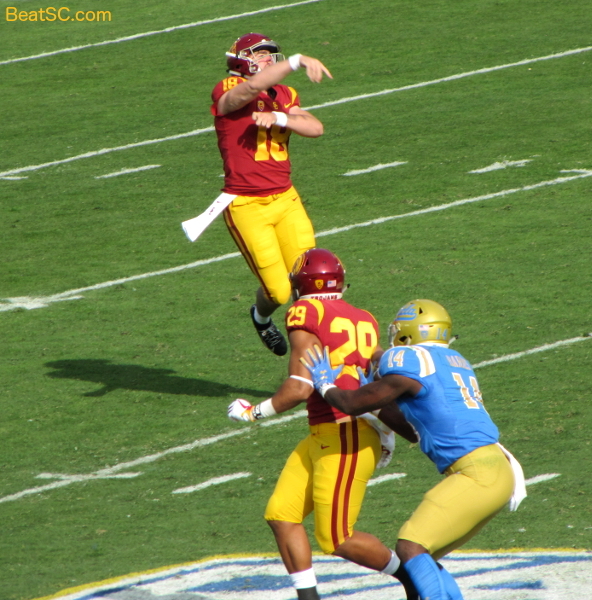 Speight keeps throwing, even with the lead, to keep sc’s defense off-balance. But Kelley keeps grinding it out. SC knew he was coming, but still couldn’t stop him. Kelley turns tiny cracks into 4-yard gains, and big cracks into Touchdowns. 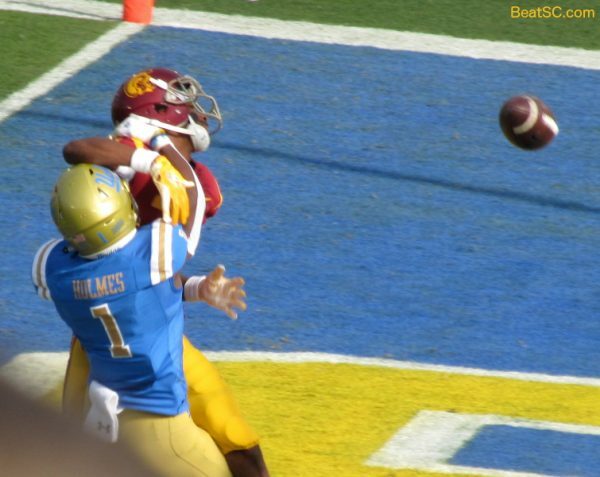 Here’s Krys Barnes saving the game with a pass deflection. Please feel free to make this your desktop wallpaper/iPhone home screen! Some Bruins celebrate the win (That #27 is not Kelley, it’s Defensive Back Patrick Jolly, just FYI, but we’re all Jolly now). "A ‘BOWL FULL OF KELLEY" was published on November 18th, 2018 and is listed in Blue & Gold News, News from the Dark Side, UCLA/usc/Sports Photos.